CKS Global Solutions has a long history in the field of industrial computer technology. With over 30-years of industrial innovation and providing quality solutions for industrial computers, we are always ready from here onwards your future. We arecommitted to providing you with the best computing solutions available anywhere. Furthermore, our industrial PC experts and technical support can keep up with your specific needs as your industry continue to improve while using our industrial computing devices. Your RMA Service Request was sent successfully. Your RMA number is below. Or click here to download and print a label. Check here to confirm that you understand and agree that all non-warranty repairs are subject to a diagnostic fee per unit. Please do not ship the unit to us just yet, a member of our team will be contact with you as soon as possible! The Serial No can be found above the Product ID and is a six digit number. The Serial No is outlined in red in the picture below. 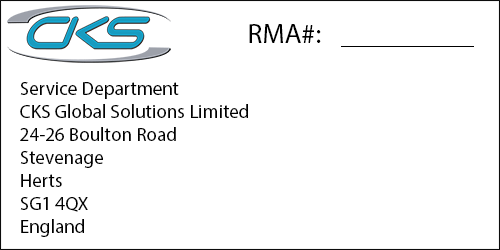 If the product is sent to CKS Global Solutions Limited with accessories that are not listed on the RMA form, the product may be sent back without the accessories that weren't listed. Thank you for completing your RMA form. Please do not ship the unit to us just yet, a member of our team will be in contact as soon as possible!